In Norway, there is usually snow for at least parts of the winter, and certainly around Christmas there is likely to be some snow. At least that was the case when I was a kid, in the good old days. Because of the snow, a lot of birds will migrate south during winter, but some are a bit tougher than the rest, and stay in Norway during the winter. While the birds probably don't need our help, it is quite common to provide some sort of food for them. For example a lot of people will have some sort of platform, which can be very simple, or more elaborate, for example a tiny house, mounted outside their window. You put some suitable food for birds on this platform, and then you can sit inside, in the comfort of your own home, and watch the birds as they eat and fight and flutter and twitter and whatever else birds do. It is really quite enjoyable. As I said, in Norway we will usually have snow for quite a while during winter. Also, it is said that if you have first begun feeding the birds, you need to keep it up until spring, otherwise they will show up expecting to find food, and if it's not there, they will die slowly and painfully from starvation. I don't know if this is strictly true, but the point is that it is quite common to keep feeding the birds all winter. But this article is supposed to be about a Christmas tradition, and now we are getting to the point. For Christmas, it is quite common to get what we call a "julenek". 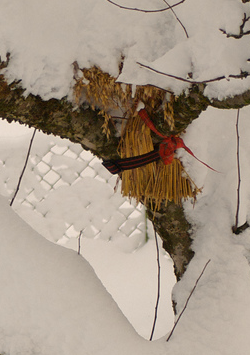 It is basically a sheaf of wheat or something similar (the word means "Christmas sheaf"), which people will tie to a tree or a pole or something in the garden, for the birds to eat. So for the rest of the winter, it's usually sunflower seeds on a platform outside the window, but for Christmas, it's a sheaf tied to a tree. Why? I have no idea. But be that as it may, the sheaf is a quite common motif for Christmas cards in Norway, and is definitely among the more Christmasier of the lesser Christmas symbols. It certainly beats julebord and juletrefest. Birds are cute. Drunken co-workers and children high on sugar not so much. Oh, that is very cute. I think we will do that when we have a garden. :) I love things like that.